Well, Friday evening I was taking my daughter Izzy to a sleepover in Maggie Valley about 6:30 p.m. We were on U.S. 276 headed south just passing K-Mart when movement in the evening sky caught my eye. A quick scan of the horizon revealed a group of 20+ nighthawks foraging in the twilight. I’ve written about nighthawks before. I knew them as bullbats when I was growing up in the Delta of northeast Louisiana and they were common in the summer and early fall as they danced in the twilight vacuuming bugs out of the sky with their wide over-sized mouths. Their dry mechanical “peeennnttt” call emanated from the sky over farm fields, cow pastures, ball fields, lakes and bayous. They were as ubiquitous as the drone of cicadas in the summer heat. 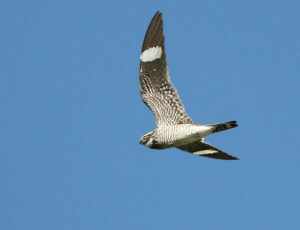 However, today, common nighthawks are disappearing from the landscape. The natural history of the whole order Caprimulgiformes is still largely an ornithological mystery. But records from breeding bird surveys, scholarly research and other citizen-science projects point to wholesale population declines. Like most North American fauna habitat destruction is a big player but because they are insectivores pesticide use is also a major concern. Because of the wide distribution of the species and an absence of good data – they nest across most of North America from Alaska to Texas – individual population thresholds (there are at least nine subspecies) are hard to assess. But according to the Cornell Lab of Ornithology there has been a cumulative decline of nearly 61 percent over the last two decades. According to the Birds of North Carolina, the common nighthawk is a scarce breeder and migrant across the mountains of North Carolina. Most of the peak counts are during fall migration in early to mid September. I did a cursory Internet search this weekend after seeing the birds in Haywood County and found that it was a pretty big weekend for common nighthawks across the region. Chris Bogardus reported seeing a hundred or so in Cullowhee last Friday and there were reports of 60 or so from around lake Junaluska on Saturday. The bullbat attribution seems to come from their bat-like insect-chasing aerobatics and the loud booming noise the male makes with its wings during courtship displays. No matter what name you want to give ‘em – you owe it to yourself to experience ‘em. Peak migration may be over now but there will still be bullbats passing through. If you need another excuse to watch a late-summer sunset descend on a pasture or cornfield or dance across a river or lake – you got it. Heck, I’ve even seen them on the top deck of the parking lot in Waynesville hawking insects near the deck lights.